Claiming eight United States Presidents, of course presidents have eaten, slept, and strode all over Virginia and in the obvious places, but what about later presidents? The ones who weren’t born in Virginia? Take a glance through history to see the interesting places United State Presidents pop up. Located in Hot Springs, Virginia and dating to 1766, The Omni Homestead Resort has been rebuilt after a 1901 fire, added onto under various owners, and remains a quintessential destination for Southern hospitality. The dignitaries and debutantes that have graced those grand halls are numerous and include 22 U.S. Presidents (Thomas Jefferson, James Madison, Woodrow Wilson, Dwight Eisenhower, James McKinley, William Taft, Richard Nixon, Ronald Reagan and Bill Clinton are among them) and The Duke and Duchess of Windsor whom stayed for 30 days. Suites and restaurants are named in honor of several of these visitors. A legitimate 1817 tavern that has never had any other purpose than to cater to travelers, Inn at the Crossroads in North Garden has welcomed presidents and will welcome you, too. A grand dame of a Southern hotel, The Jefferson Hotel in Richmond has been a go-to for the glamorous and famous since 1895, even through a couple of fires, exchanges of ownership, additions and renovations. Esteemed guests have included a host of presidents, including Benjamin Harrison, William McKinley, Woodrow Wilson, Calvin Coolidge, William Howard Taft, Franklin Delano Roosevelt, Theodore Roosevelt, Harry Truman, Ronald Reagan, George H. W. Bush, George W. Bush, Bill Clinton (post presidency for the inauguration of Virginia Governor Terrence McAuliffe), and Barack Obama. Additional guests are numerous and include Vanderbilts, Sir Edmund Hilary, Charlie Chaplin, Ray Charles, Frank Sinatra and Elvis Presley. 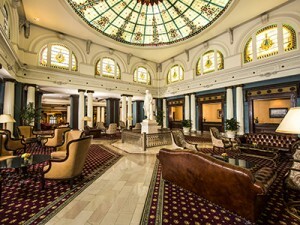 This grand hotel was first opened in 1927 and was an important icon of luxury accommodations in the Virginia Beach area. Although closed for renovations until 2017, the Cavalier Hotel in Virginia Beach has hosted a total of nine U.S. Presidents: Calvin Coolidge, Herbert Hoover, Harry Truman, Dwight Eisenhower, John F. Kennedy, Lyndon Johnson, Richard Nixon, Gerald Ford, and George Bush. In addition to being a hotel, the Cavalier was also a major performance venue. Frank Sinatra and Bing Crosby both performed at this impressive destination, and many huge names in American history, like F. Scott Fitzgerald, Judy Garland, and Will Rogers all stayed at the Cavalier during its storied history. With the current renovations, the hotel will regain some of its former glory and grandeur. Berryville’s Rosemont Manor is an elegant destination for anyone, but has a history of being a getaway retreat for presidents and celebrities. Once owned by Governor and U.S. Senator Harry Flood Byrd, Sr., Rosemont’s twelve suites are named for some of its more prominent guests. Specifically, Franklin D. Roosevelt, Dwight Eisenhower, John F. Kennedy, Lyndon B. Johnson (while U.S. Senator), Charles Lindbergh, Sir Winston Churchill, and Albert Einstein. Yes, Einstein. So cool. It is reported that Richard Nixon was also a guest at Rosemont, but apparently the owners ran out of suites to name. While this is not a place you can visit or stay, I’m hoping to see it made available as a bed and breakfast one day. Wexford is the only home that President and Mrs. Kennedy designed and built from the ground up, and it’s located near Middleburg, Virginia. The estate is currently on the market and includes much of its original features like parquet flooring, stable, bunker and Secret Service dependencies. Note that the estate was also called Rattlesnake Mountain and Atoka. It was not until after President Kennedy’s passing that Mrs. Kennedy called it Wexford in honor of her husband’s Irish heritage. An additional note about Wexford: President and Mrs. Reagan leased the property during his presidential campaign in 1980 and also spent time there prior to inauguration. Before Camp David, President Herbert Hoover saw the need for a “Summer White House” and sought out to create one. President and Mrs. Hoover built their Rapidan Camp retreat in early 1929 on 164 acres on the Eastern Slope of the Blue Ridge Mountains in what is today’s Shenandoah National Park. Rapidan Camp was comprised of 13 rustic cabins constructed over a period of years by the Marine Corps as part of training exercises. Mrs. Hoover hired the architect and helped design the camp. Guests of the Hoover’s while at Rapidan Camp included Charles Lindbergh, Mrs. Thomas Edison, Mr. and Mrs. Theodore Roosevelt, Jr. and British Prime Minister Ramsay McDonald. In 1932 the Hoover’s donated the camp to the Commonwealth of Virginia and asked that it be made available to future presidents, which it was. President Jimmy Carter was the last to use it. All that remains of Rapidan Camp are three buildings; two are restored to their 1929 appearance and are accessible by a ranger-led tour in Shenandoah National Park. Do you have additional information on this topic? Feel free to leave a comment to help us add to the list! I grew up about 2 blocks from Rosemont Manor in Berryville. It’s such a beautiful place and it was surrounded by apple orchards in those days. I would love to see it inside some day.